Flying models range from simple toy gliders made of card stock or foam polystyrene to powered scale models made from materials such as balsa wood, bamboo, plastic, styrofoam, carbon fiber, or fiberglass and are skinned with tissue paper or mylar covering. Some can be very large, especially when used to research the flight properties of a proposed full scale design. Aircraft manufacturers and researchers also make wind tunnel models not capable of free flight, used for testing and development of new designs. Sometimes only part of the aircraft is modelled. Fokker F28 static desk model. Static model aircraft (i.e. those not intended to fly) are scale models built using plastic, wood, metal, paper, fiberglass or any other suitable material. Some static models are scaled for use in wind tunnels, where the data acquired is used to aid the design of full scale aircraft. Models are available that have already been built and painted; models that require construction, painting and gluing; or models that have been painted but need to be clipped together. A collection of model airliners in 1:200 scale. Most of the world's airlines allow their fleet aircraft to be modelled as a form of publicity.These include Delta Air Lines, Air France, British Airways, Aerolíneas Argentinas, Avianca, Aeroméxico, FedEx, Polar Air Cargo, Air New Zealand, Qantas, China Airlines, Singapore Airlines, South African Airways, Finnair, American Airlines, United Airlines, Lufthansa, Japan Airlines, Royal Jordanian, Korean Airlines, and Asiana Airlines. In the early days, airlines would order large models of their aircraft and supply them to travel agencies as a promotional item. In addition, airlines and airplane makers hand out desktop model airplanes to airport, airline and government officials as a way of promoting their airline, celebrating a new route or an achievement. Former Puerto Rico governor Alejandro García Padilla, for example, has models of JetBlue, Lufthansa, Avianca, and Seaborne Airlines which were given to him by those airlines after starting or increasing flights to San Juan during his tenure. A Lufthansa Focke-Wulf model on display. Static model aircraft are primarily available commercially in a variety of scales from as large as 1:18 scale to as small as 1:1250 scale. Plastic model kits requiring assembly and painting are primarily available in 1:144, 1:72, 1:50, 1:48, 1:32, and 1:24 scale, often depending on the size of the original subject. Die-cast metal models (pre-assembled and factory painted) are primarily available in 1:400, 1:200, 1:72, 1:600, 1:500, 1:300, 1:250, and 1:48. A variety of odd scales (e.g. 1:239) are also available, but less common. Scales are not usually random, but are based upon simple divisions of either the Imperial system, or the Metric system. For example, 1:48 scale is 1/4" to 1-foot (or 1" to 4 feet) and 1:72 is 1" to 6 feet, while metric scales are simpler, such as 1:100th, which equals 1 centimeter to 1 meter. 1:72 scale was first introduced in the Skybirds wood and metal model aircraft kits in 1932. Skybirds was followed closely by Frog which produced 1:72 scale aircraft in 1936 under the "Frog Penguin" name. According to Fine Scale Modeler magazine, 1:72 was also popularized by the US War Department during the Second World War when it requested models of single engine aircraft at that scale. The War Department also requested models of multi-engine aircraft at a scale of 1:144. The War Department was hoping to educate Americans in the identification of aircraft. These scales provided the best compromise between size and detail. After WWII, manufacturers continued to favor these scales, however kits are commonly available in 1:48, 1:35, 1:32, and 1:24 scales. The French firm Heller SA is one of the few manufacturer to offer models in the scale of 1:125, while 1:50th and 1:100th are more common in Japan and France which both use Metric. 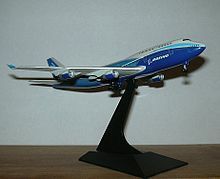 Herpa and others produce promotional models for airlines in scales including 1:200, 1:400, 1:500, 1:600, 1:1000 and more. A few First World War aircraft were offered at 1:28 by Revell, such as the Fokker Dr.I and Sopwith Camel. A number of manufacturers have made 1:18th scale aircraft to go with cars of the same scale. Aircraft scales have commonly been different from the scales used for military vehicles, figures, cars, and trains. For example, a common scale for early military models was 1:76, whereas companies such as Frog were producing aircraft with a scale of 1:72. Recently military vehicles have adapted to the aircraft standards of 1:72. This has resulted in a substantial amount of duplication of the more famous subjects in a large variety of sizes, which while useful for forced perspective box dioramas has limited the number of possible subjects to those that are more well known. Less produced scales include 1:64 (better known as S-Gauge or "American Flyer Scale"), 1:96, and 1:128. Many older plastic models do not conform to any established scale as they were sized to fit inside standard commercially available boxes, leading to the term "Box Scale" to describe them. When reissued, these kits retain their unusual scales. 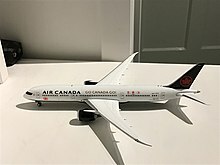 A die cast Boeing 787-9 Dreamliner of Air Canada in 1:400 scale, produced by Phoenix Model. The most common form of manufacture for kits is injection molded polystyrene plastic, using carbon steel molds. Today, this takes place mostly in China, Taiwan, the Philippines, South Korea, and Eastern Europe. Injection molding allows a high degree of precision and automation not available in the other manufacturing processes used for models but the molds are expensive and require large production runs to cover the cost of making them. Smaller and cheaper runs can be done with cast copper molds, and some companies do even smaller runs using cast resin or rubber molds, but the durability is of a lower standard than carbon steel and labour costs are higher. Specialized kits cast in resin are available from companies such as Anigrand, Collect Aire, CMK, CMR, and Unicraft, made in molds similar to those used for limited run plastic kits, but usually not as durable, hence the much smaller numbers of each kit that are made, and their higher price. Vacuum forming is another common alternative to injection molded kits but require more skill to assemble, and usually lack detail parts that must be supplied by the modeller. There is a handful of photo etched metal kits which allow a high level of detail but can be laborious to assemble, and lack the ability to replicate certain shapes. Scale models can be made from paper (normal or heavy) or card stock. Commercial models are printed by publishers mainly based in Germany or Eastern Europe. Card models are also distributed through the internet, and several are offered this way for free. Card model kits are not limited to just aircraft, with kits being available for all types of vehicles, buildings, computers, firearms and animals. From World War I through the 1950s, flying model airplanes were built from light weight bamboo or balsa wood and covered with tissue paper. This was a difficult, time consuming process that mirrored the actual construction of airplanes through the beginning of World War II. The Cleveland Model and Supply Corporation made the most complex, challenging kits, while Guillow's made simpler, relatively easy kits. Many model makers became adept at creating models from drawings of the actual aircraft. Ready-made models (desk-top models) include those produced in fiberglass for travel agents and aircraft manufacturers, as well as collectors models made from die-cast metal, mahogany, resin and plastic. Generally known collectively in all its forms as the sport and pastime of aeromodelling, some flying models resemble scaled down versions of full scale aircraft, while others are built with no intention of looking like real aircraft. There are also models of birds and flying dinosaurs. The reduced size affects the model's Reynolds number which determines how the air reacts when flowing past the model, and compared to a full sized aircraft the size of control surfaces needed, the stability and the effectiveness of specific airfoil sections may differ considerably requiring changes to the design. Free flight (F/F) model aircraft fly without external control from the ground. The aircraft must be set up before flight so that its control surfaces, and weight allow stable flight. Most free flying models are either unpowered gliders or rubber powered. This type of model pre-dates manned flight. Control line (C/L) model aircraft use cables to tether a plane to a central point, either held by hand or to a pole. The aircraft is then flown around the point in circles. Usually two cables are used which tether the model and also, through a bellcrank connection to the aircraft's elevator, control it in pitch. Radio-controlled aircraft have a transmitter operated by the controller, sending signals to a receiver in the model which in turn actuates servos which manipulate the model's flight controls in a similar manner to a full sized aircraft. In traditional aircraft, the radio has directly controlled the servos. However, modern aircraft often use flight controlling computers to stabilize an aircraft or even to fly the aircraft autonomously. This is particularly the case with quadcopters. The construction of flying models differs from that of most static models as both weight and strength (and the resultant strength-to-weight ratio) are major considerations. Flying models borrow construction techniques from full-sized aircraft although the use of metal is limited. These might consist of forming a frame using thin planks of a light wood such as balsa to duplicate the formers, longerons, spars, and ribs of a vintage full-size aircraft, or, on larger (usually powered) models where weight is less of a factor, sheets of wood, expanded polystyrene, and wood veneers may be employed. Regardless of the underlying structure, it is then skinned and subsequently doped to provide a smooth sealed surface. For light models, tissue paper is used. After it is applied, the paper is sprayed with a mist of water, which causes the paper to shrink when it dries. For larger models (usually powered and radio controlled) heat-curing or heat shrink covering plastic films or heat-shrinkable synthetic fabrics are applied to the model then heated using a hand held hair dryer, laundry iron or heat gun to tighten the material and adhere to the frame. Microfilm covering is used for the very lightest models and is made by bringing a wire loop up through water to pick up a thin plastic film on the surface made from a few drops of lacquer spread out over several square feet. For a more mass market approach, "foamies," or aircraft injection-molded from lightweight foam (sometimes reinforced) have made indoor flight more accessible to hobbyists. Many require little more than attachment of the wing and landing gear. Flying models can be assembled from kits, built from plans or made completely from scratch. A kit contains the necessary raw material, typically die- or laser-cut wood parts, some molded parts, plans, assembly instructions and has usually been tested. Plans are intended for the more experienced modeller, since the builder must make or find all the parts themselves. Scratch builders may draw their own plans, and source all the materials themselves. Any method may be labour-intensive, depending on the model in question. To increase the hobby's accessibility to the inexperienced, vendors of model aircraft have introduced Almost Ready to Fly (ARF) designs which reduce the time and skills required. A typical ARF aircraft can be built in under 4 hours, versus 10–20 or more for a traditional kit. Ready To Fly (RTF) radio control aircraft are also available, however among traditionalists, RTF models are controversial as many consider model building integral to the hobby. Gliders do not have an attached powerplant. Larger outdoor model gliders are usually radio-controlled gliders and hand-winched against the wind by a line attached to a hook under the fuselage with a ring, so that the line will drop when the model is overhead. Other methods include catapult-launching, using an elastic bungee cord. The newer "discus" style of wingtip hand-launching has largely supplanted the earlier "javelin" type of launch. Also using ground-based power winches, hand-towing, and towing aloft using a second powered aircraft. Gliders sustain flight through exploitation of the wind in the environment. A hill or slope will often produce updrafts of air which will sustain the flight of a glider. This is called slope soaring, and when piloted skillfully, radio controlled gliders can remain airborne for as long as the updraft remains. Another means of attaining height in a glider is exploitation of thermals, which are columns of warm rising air created by differences of temperature on the ground such as between an asphalt parking lot and a lake. Heated air rises, carrying the glider with it. As with a powered aircraft, lift is obtained by the action of the wings as the aircraft moves through the air, but in a glider, height is only gained by flying through air that is rising faster than the aircraft is sinking relative to the airflow. Sailplanes are flown using thermal lift. As thermals can only be indirectly observed through the reaction of the aircraft to the invisible rising air currents, skill is required to find and stay in the thermals. Paragliders use a special type of steerable parachute for a wing. Control is exercised through lines that deform the trailing edge of the airfoil or the wing's end regions. Walkalong gliders are lightweight model airplanes flown in the ridge lift produced by the pilot following in close proximity. In other words, the glider is slope soaring in the updraft of the moving pilot (see also Controllable slope soaring). Powered models contain an onboard powerplant, a mechanism powering propulsion of the aircraft through the air. Electric motors and internal combustion engines are the most common propulsion systems, but other types include rocket, small turbine, pulsejet, compressed gas, and tension-loaded (twisted) rubber band devices. An old method of powering free flight models is Alphonse Pénaud's elastic motor, essentially a long rubber band that is wound up prior to flight. It is the most widely used powerplant for model aircraft, found on everything from children's toys to serious competition models. The elastic motor offers extreme simplicity and survivability, but suffers from limited running time, and the fact that the initial high torque of a fully wound motor drops sharply before 'plateauing' to a more steady output, until finally declining as the final turns unwind. Using this torque curve efficiently is one of the challenges of competitive free-flight rubber flying, and variable-pitch propellers, differential wing and tailplane incidence and rudder settings, controlled by an on-board timeswitch, are among the means of managing this varying torque and there is usually a motor weight restriction in contest classes. Even so, a competitive model can achieve flights of nearly 1 hour. Stored compressed gas, typically carbon dioxide (CO2), can also power simple models in a way similar to filling a balloon and then releasing it. A more sophisticated use of compressed CO2 is to power a piston expansion engine, which can turn a large, high-pitch propeller. These engines can incorporate speed controls and multiple cylinders, and are capable of powering lightweight scale radio-controlled aircraft. Gasparin and Modela are two recent makers of CO2 engines. CO2, like rubber, is known as "cold" power because it becomes cooler when running, rather than hotter as combustion engines and batteries do. Steam, which is even older than rubber power, and like rubber, contributed much to aviation history, is now rarely used. In 1848, John Stringfellow flew a steam-powered model, in Chard, Somerset, England. Hiram Stevens Maxim later showed that steam can even lift a man into the air. Samuel Pierpont Langley built steam as well as internal combustion models that made long flights. Baronet Sir George Cayley built, and perhaps flew, internal and external combustion gunpowder-fueled model aircraft engines in 1807, 1819, and 1850. These had no crank, working ornithopter-like flappers instead of a propeller. He speculated that the fuel might be too dangerous for manned aircraft. All internal combustion engines generate substantial noise (and engine exhaust) and require routine maintenance. In the "scale-R/C" community, glow-engines have long been the mainstay until recently. Vendors of model engines rate size in terms of engine displacement. Common sizes range from as small as 0.01 cubic inch (in3) to over 1.0 in3 (0.16 cc–16 cc). Under ideal conditions, the smallest .01 engines can turn a 3.5 inches (8.9 cm) propeller at speeds over 30,000 rpm, while the typical larger (.40-.60 cubic inch) engine will turn at 10–14,000 rpm. The simplest glow-engines operate on the two-stroke cycle. These engines are inexpensive, yet offer the highest power-to-weight ratio of all glow-engines, but can often generate a great deal of noise, requiring substantially-sized expansion chamber mufflers to reduce their noise output, of both tuned exhaust and non-tuned varieties. Glow engines which operate on the four-stroke cycle, whether using ordinary poppet valves or occasionally rotary valves offer superior fuel-efficiency (power-output per fuel-consumption), but deliver less power than two-stroke engines of the same displacement – yet, often because the power they deliver is more suited to turning somewhat larger diameter propellers for lighter weight, more drag-producing airframe designs such as biplanes and scale aircraft models of pre-World War II full-scale subjects, four-stroke model engines, fueled either with methanol or gasoline fuels are slowly increasing in popularity from their generally lower noise output when compared to similar displacement two-stroke engines, and are available (for larger displacement, multi-cylinder four-stroke engines) in opposed twin and radial engine layouts. A very large "giant scale" US Coast Guard C-130J Hercules radio control flying model. The wingspan is 18 feet 6 inches (5.64 m). The crew of five who fly and maintain it are in the background. Internal combustion (IC) engines are also available in upscale (and up-price) configurations. Variations include engines with multiple-cylinders, spark-ignited gasoline operation, and carbureted diesel operation. The term "diesel" is in fact a misnomer, as such engines actually operate by compression-ignition. The compression-ratio is controlled by an adjustable threaded T screw on the cylinder head, bearing onto a contra piston within the cylinder bore. Diesels are preferred for endurance competition, because of their fuel's higher energy content, a mixture of ether and kerosene (with lubricating oil). They have higher torque, and for a given capacity, they can usually "swing" a larger propeller than a glow engine. Home manufacture of model aircraft engines is an established hobby in its own right. Early "jet" style model aircraft utilized a multi-blade and high pitched propeller (fan) inside ductwork, usually in the fuselage of the aeroplane. The fans were generally powered by 2 stroke piston engines that were designed to operate at high RPM. Early brands of these units were the Kress, Scozzi, and Turbax, among others. They generally used 0.40 to 0.90 cubic inch displacement engines, but Kress made a model for engines as small as 0.049 (1/2cc). This basic fan-in-tube design has been adopted very successfully for modern electric powered "jet" aircraft and are now quite popular. Glow engine powered ducted-fan aircraft are now relatively uncommon. A major development is the use of small jet turbine engines in hobbyist models, both surface and air. Model-scale turbines resemble simplified versions of turbojet engines found on commercial aircraft, but are in fact new designs (not based upon scaled-down commercial jet engines.) The first hobbyist-developed turbine was developed and flown in the 1980s by Gerald Jackman in England, but only recently has commercial production (from companies such as Evojet in Germany) made turbines readily available for purchase. Turbines require specialized design and precision-manufacturing techniques (some designs for model aircraft have been built from recycled turbocharger units from car engines), and consume a mixture of A1 jet fuel and synthetic turbine engine or motorcycle-engine oil. These qualities, and the turbine's high-thrust output, makes owning and operating a turbine-powered aircraft prohibitively expensive for most hobbyists, as well as many nations' national aeromodeling clubs (as with the USA's AMA) requiring their users to be certified to know how to safely and properly operate the engines they intend to use for such a model. Jet-powered models attract large crowds at organized events; their authentic sound and high speed make for excellent crowd pleasers. Operating on the same principle as World War II V-1 flying bomb have also been used. The extremely noisy pulsejet offers more thrust in a smaller package than a traditional glow-engine, but is not widely used. A popular model was the "Dynajet". Due to the noise, the use of these is illegal in some countries. Rocket engines are sometimes used to boost gliders and sailplanes, the earliest being the 1950s model rocket motor called the Jetex engine. This uses solid fuel pellets, ignited by a wick fuse; the casing is reuseable. These days, flyers can also mount single-use model rocket engines to provide a short (less than 10 second) burst of power. In some countries, government regulations and restrictions initially rendered rocket-propulsion unpopular, even for gliders; now, though, their use is expanding, particularly in scale model rocketry. Self-regulation of the sport and widespread European availability of single use 'cartridge' motors seemed to ensure a future, but in recent years the cartridges (known as "Rapier" units) have become difficult to obtain, due to a reclassification from "smoke producing devices" to "fireworks". They are still produced in the Czech Republic, but importing/exporting them is problematic at the present time (2014). In electric-powered models, the powerplant is a battery-powered electric motor. Throttle control is achieved through an electronic speed control (ESC), which regulates the motor's output. The first electric models were equipped with brushed DC motors and rechargeable packs of nickel cadmium cells (NiCad), giving modest flight times of 5–10 minutes. (A fully fueled glow-engine system of similar weight and power would likely provide double the flight-time.) Later electric systems used more-efficient brushless DC motors and higher-capacity nickel metal hydride (NiMh) batteries, yielding considerably improved flight times. The recent development of cobalt-content lithium polymer batteries (LiPoly or LiPo) now permits electric flight-times to approach, and in many cases[example needed] surpass that of glow-engines – however, the increasing popularity of the much more rugged and durable, cobalt-free lithium iron phosphate-celled batteries is increasingly attracting attention away from LiPo packs. There is also solar powered flight, which is becoming practical for R/C hobbyists. In June 2005 a record of 48 hours and 16 minutes was established in California for this class. Electric-flight was tested on model aircraft in the 1970s, but its high cost prevented widespread adoption until the early 1990s, when falling costs of motors, control systems and, crucially, more practical battery and electric power technologies, with the increasing adoption of brushless motors powered with better battery chemistries and controlled with an electronic speed control in place of a throttle servo came on the market. Electric-power has made substantial inroads into the park-flyer and 3D-flyer markets. Both markets are characterized by small and lightweight models, where electric-power offers several key advantages over IC: greater efficiency, higher reliability, less maintenance, much less messy and quieter flight. The 3D-flyer especially benefits from the near-instantaneous response of an electric-motor. Starting around the year 2008 the entry of Chinese direct-to-consumer suppliers into the hobby market has dramatically decreased the cost of electric flight. It is now possible to power most models weighing less than 20 lb with electric power for a cost equivalent to or lower than traditional power sources. This is the most rapidly developing segment of the hobby as of end of year 2010, along with the increasing popularity of FPV radio control aeromodeling, most often with electric-powered model aircraft, especially multirotor designs. Most powered model-aircraft, including electric, internal-combustion, and rubber-band powered models, generate thrust by spinning an airscrew. The propeller is the most commonly used device. Propellers generate thrust due to the angle of attack of the blades, which forces air backwards. For every action there is an equal and opposite reaction, thus the plane moves forwards. As in full-size planes, the propeller's dimensions and placement (along the fuselage or wings) are factored into the design. In general, a large diameter and low-pitch offers greater thrust and acceleration at low airspeed, while a small diameter and higher-pitch sacrifices thrust for a higher maximum-airspeed. In model aircraft, the builder can choose from a wide selection of propellers, to tailor the model's airborne characteristics. A mismatched propeller will compromise the aircraft's airworthiness, and if too heavy, inflict undue mechanical wear on the powerplant. Model aircraft propellers are usually specified as diameter × pitch, both given in inches. For example, a 5x3 propeller has a diameter of 5 inches (130 mm), and a pitch of 3 inches (76 mm). The pitch is the distance that the propeller would advance if turned through one revolution in a solid medium. Additional parameters are the number of blades (2 and 3 are the most common). With the direct-drive method, the propeller is attached directly on the engine's spinning crankshaft (or motor shaft). This arrangement is optimum when the propellor and powerplant share overlapping regions of best efficiency (measured in RPM.) Direct-drive is by far the most common when using a fuel-powered engine (gas or glow). Some electric motors with high torque and (comparatively) low speed can utilize direct-drive as well. These motors are typically outrunners. With the reduction method, the crankshaft drives a simple transmission, which is usually a simple gearbox containing a pinion and spur gear. The propeller speed is inversely proportional to the gear ratio (thereby also increasing output torque by approximately the same ratio). Reduction-drive is common on larger aircraft and aircraft with disproportionately large propellers. On such powerplant arrangements, the transmission serves to match the powerplant's and propeller's optimum operating speed. Geared propellers are rarely used on internal combustion engines, but very commonly on electric motors. This is because most inrunner electric motors spin extremely fast, but have very little torque. A unique form of sleeve valved methanol-fueled four-stroke model engine from the RCV firm of the United Kingdom essentially possesses a built-in 2:1 gear reduction ratio, due to its unique "camshaft drive" method of using the spinning, closed-top cylinder liner (which forms a combustion chamber for the design) to both transmit the power to the propeller through an integral forward-projecting powershaft, while also simultaneously fulfilling the "camshaft" role of a four-stroke engine's valve timing element, achieving the 2:1 gear reduction. Ducted fans are propellors encased in a cylindrical housing or duct, designed to look like and fit in the same sort of space as a model jet engine but at a much lower cost. They are available for both electric and liquid-fuelled engines, although they have only become widely used with the recent improvements in electric-flight technology for model aircraft. It is possible to equip a model jet aircraft with two or four electric ducted fans for much less than the cost of a single jet turbine or large petrol or methanol engine, enabling affordable modeling of multi-engine planes, including military bombers and civilian airliners. The fan-unit is an assembly of the spinning fan (a propellor with more blades), enclosed inside a shaped-duct. Compared to an open-air propellor, a ducted-fan generates more thrust per crossectional-area. The shaped-duct often limits installation to recessed areas of the fuselage or wings. Ducted fans are popular with scale-models of jet-aircraft, where they mimic the appearance and feel of jet engines, as well as increasing the model's maximum airspeed. Speeds of up to 200 mph have been recorded on electric-powered ducted fan airplanes, largely due to the high amount of RPMs produced by ducted fan propellors. But they are also found on non-scale and sport models, and even lightweight 3D-flyers. Like propellors, fan-units are modular components, and most fan-powered aircraft can accommodate a limited selection of different fan-units. With ornithopters the reciprocating-motion of the wing structure imitates the flapping-wings of living birds, producing both thrust and lift. Free flight models are flown without any form of mechanical or radio control over the model in flight. This is the earliest form of aeromodelling, a particular milestone being the first model powered by a rubber band built and flown by Alphonse Pénaud in 1871. An international aeromodelling competition called the Wakefield Gold Challenge Cup after the donor, Lord Wakefield. It was first held on July 5, 1911 at The Crystal Palace in England. There were contests in 1912, 1913 and 1914. For many years after the First World War there was no contest. The original trophy had been lost and so in 1927 the Society of Model Aeronautical Engineers (SMAE) approached Lord Wakefield and were offered a new larger silver trophy for international competition. This trophy is the present Wakefield International Cup and was first awarded at a competition in 1928. The SMAE developed the international competition up to 1951 when it was handed to the authority of the FAI and has since become the award for the rubber-power category at the FAI World Free Flight Championships. For the conventional control-line system, tension in the lines is required to provide control. Line tension is maintained largely by centrifugal force. To increase line tension, models may be built or adjusted in various ways. Rudder offset and thrust vectoring (tilting the engine toward the outside) yaw the model outward. The position where the lines exit the wing can compensate for the tendency of the aerodynamic drag of the lines to yaw the model inboard. Weight on the outside wing, an inside wing that is longer or has more lift than the outside wing (or even no outside wing at all) and the torque of a left rotating propeller (or flying clockwise) tend to roll the model toward the outside. Wing tip weights, propeller torque, and thrust vectoring are more effective when the model is going slowly, while rudder offset and other aerodynamic effects have more influence on a fast moving model. Since its introduction, control line flying has developed into a competition sport. There are contest categories for control line models, including Speed, Aerobatics (AKA Stunt), Racing, Navy Carrier, Balloon Bust, Scale, and Combat. There are variations on the basic events, including divisions by engine size and type, skill categories, and age of model design. The events originated largely in the United States, and were later adapted for use internationally. The rules for US Competition are available from the Academy of Model Aeronautics. The international rules are defined by the Fédération Aéronautique Internationale (FAI). World Championships are held semiannually throughout the world, most recently in 2008 in France, with a limited slate of events – special varieties of Racing (F2C or "Team Race"), combat (F2D), and speed (F2A), all limited to engines displacing 0.15 cu. in (2.5cc), and Stunt (F2b) which is essentially unlimited with regard to design and size. The international class of racing is referred to as F2C (F2 = Control-line, C=racing) or Team Race. A pilot and a mechanic compete as a team to fly small (370 grams; 13 ounces) 65 cm (25.5 in) wingspan semi-scale racing models over a tarmac or concrete surface. Lines are 15.92 meters (52.2 feet) long. Three pilots, plus mechanic teams, compete simultaneously in the same circle, and the object is to finish the determined course as fast as possible. Tank size is limited to 7 cc, thus 2–3 pitstops for refueling are needed during the race. The mechanic stands at a pit area outside the marked flight circle. The engine will be started and the model released at the start signal. For refuelling, the pilot will operate a fuel shutoff by a quick down elevator movement after the planned number of laps so that the model can approach the mechanic at optimum speed, around 50 km/h (31 mph). The mechanic will catch the model by the wing, fill the tank from a pressurized can by a hose and finger valve, then restart the engine by hitting the carbon fiber/epoxy resin propeller with his finger. Ground time of a good pitstop is less than three seconds. The race course is 10 km, corresponding to 100 laps. Flying speeds are around 200 km/h (120 mph), which means that the pilots have to turn one lap in 1.8 seconds. Line pull due to centrifugal force is 85 N (17 lb). A faster model will overtake by the pilot steering it above the slower one while he moves his handle with lines over the opponent pilot's head. After two rounds of elimination heats, the 6, 9 or 12 fastest teams enter two semifinal rounds, and the three fastest teams in the semifinals go to the final, which is run over the double course. Maximum engine size is 2.5 cc (.15 cu.in.). Diesel, i.e. compression ignition engines are used. They are single cylinder two-stroke, designed for this purpose. At the world championship level it is not uncommon that the competitors design and build their own engines. Their output power is approaching .8 horsepower at 25,000 rpm. Pylon racing refers to a class of air racing for radio controlled model aircraft that fly through a course of pylons. The sport is similar to the full-scale Red Bull Air Race World Series. The FAI Drone Racing World Cup is in the F3U class (Radio Control Multi-rotor FPV Racing). This is a highly competitive activity, involving mental exertion and big cash prizes. Aircraft manufacturers and researchers make models for various purposes. Besides static display for marketing purposes these include models for aerodynamic research and engineering manufacture. Research models are made for wind-tunnel and free-flight testing. For wind tunnel research especially, it is often only necessary to make part of the proposed aircraft. Full-scale static engineering models are constructed for production development, often made of different materials from the proposed design. Again, often only part of the aircraft is modeled. The flight behavior of an aircraft depends on the scale to which it is built, the density of the air and the speed of flight. At subsonic speeds the relationship between these is expressed by the Reynolds number. Where two models at different scales are flown with the same Reynolds number, the airflow will be similar. Where the Reynolds numbers differ, as for example a small-scale model flying at lower speed than the full-size craft, the airflow characteristics can differ significantly. This can make an exact scale model unflyable, and the model has to be modified in some way. For example, drag is generally greater in proportion at low Reynolds number so a flying scale model usually requires a larger-than-scale propeller. At higher speeds approaching or exceeding the speed of sound, the Mach number becomes important (the speed of sound is Mach 1). At these speeds the air becomes compressible and its characteristics change dramatically, with shock waves forming. Fast jets are often inefficient at low airspeeds, so a model designed to fly at the speed of sound will also be inefficient at lower speeds. In particular, the swept wings and pointed noses common on fast jets tend to increase drag or impair handling at lower speeds. Maneuverability also depends on scale, with stability also being more important. Control torque is proportional to lever arm length while angular inertia is proportional to the square of the lever arm, so the smaller the scale the more quickly an aircraft or other vehicle will turn in response to control or other forces. One consequence of this is that models in general require additional longitudinal and directional stability, resisting sudden changes in pitch and yaw. While it may be possible for a pilot to respond quickly enough to control an unstable aircraft (such as a Wright Flyer), a radio control scale model of the same aircraft would only be flyable with design adjustments such as increased tail surfaces and wing dihedral for stability, or with avionics providing artificial stability. Free flight models need to have both static and dynamic stability. Static stability is the resistance to sudden changes in pitch and yaw already described, and is typically provided by the horizontal and vertical tail surfaces respectively, and by a forward center of gravity. Dynamic stability is the ability to return to straight and level flight without any control input. The three dynamic instability modes are pitch (phugoid) oscillation, spiral and Dutch roll. An aircraft with too large a horizontal tail on a fuselage that is too short may have a phugoid instability with increasing climbs and dives. With free flight models, this usually results in a stall or loop at the end of the initial climb. Insufficient dihedral and sweep back will generally lead to increasing spiral turn. Too much dihedral or sweepback generally causes Dutch roll. These all depend on the scale, as well as details of the shape and weight distribution. For example, the paper glider shown here is a contest winner when made of a small sheet of paper but will go from side to side in Dutch roll when scaled up even slightly. ^ Scott Mayerowitz, AP Airlines Writer (18 March 2015). "Airline world's tiny secret: infatuation with model planes". USA TODAY. ^ Revell's Wright Flyer was reissued in the original and unusual scale of 1:39. ^ Koster Aero Enterprises, Welsh Models, DynaVector, and AirModel manufacture vacuum formed models. ^ Card model kit companies, smaller even than vacuum formed manufacturers, include Schreiber-Bogen (one of the largest), ModelArt, Halinski, Modelik, JSC, Williamshaven and FlyModel. ^ "Model Flying Machines". geocities.com. Archived from the original on 28 October 2009. ^ AMA. "AMA Documents – Turbines". AMA. Retrieved 5 October 2012. ^ Keith Lawes. "The Rotating Cylinder Valve 4-stroke Engine (SAE Paper 2002-32-1828)" (PDF). Archived from the original (PDF) on 12 November 2011. Retrieved 3 January 2012. ^ "FAI Official site". Retrieved 21 June 2017. ^ "National Miniature Pylon Racing". nmpra.net. NMPRA. Retrieved 6 July 2015. Wikimedia Commons has media related to Models of aircraft.